Benefits: These are are simplest systems and the most cost effective to install. These systems will pay for themselves by offsetting utility bills in 3-8 yrs. Downside: These do not provide power during a grid outage. Conclusion: They are simple enough that you can install it yourself in a weekend with a friend. They are cost effective enough to pay for themselves and put money in your pocket long term. If you want to reduce your electric bill and your carbon footprint this is a good choice. 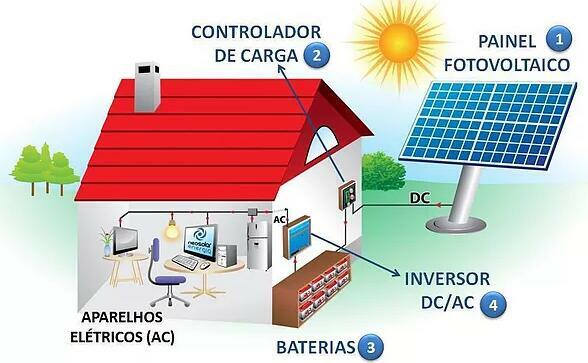 Definition: These systems allow you to store your solar power in batteries for use when the power grid goes down or if you are not on the grid. 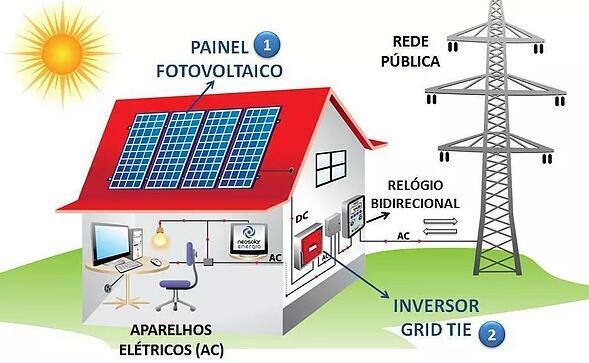 Hybrid systems provide power to offset the grid power whenever the sun is shining and will even send excess power to the grid for credit for later use. Benefits: Provides power for your critical loads when the power grid is down. Downside: Cannot be expected to provide power for all your loads since the cost and volume of batteries would be prohibitive. Off-Grid systems require a lot more specialized equipment to function that is more costly and more complex to install. Specifically they require a central/string inverter, a charge controller as well as a batteries. Sizing the solar array and the batteries required is complex. Detailed analysis of your requirements will be needed to provide for your minimal critical needs. You’ll also need to rewire you main electrical panel to isolate the “critical loads” so that only they are provided power in an outage. This means that your well pump, refrigerator and a few lights are provided power while your air conditioners and TV and other non-essential loads are not. This is definately more complex to install as well. There are dangerious components, mostly dealing with high amp batteries so caution needs to be exercised. Also, batteries are expensive, require ongoing maintenance and periodic replacement. Given the additional specialized equipment required and the fact that it requires come complex installation, expect a off-grid system to cost four(4) times as much to install per watt and to require ongoing maintenance outlays. We do not recommend off-grid systems for the average homeowner/handyman. They are not cost effective nor are they easily homeowner installable. You can expect to pay 3 – 4 times the cost of a grid-tied system for a similar off-grid system providing suitable battery power for your needs. We usually recommend installing a standard grid-tied solar system and investing in a standard backup generator for a fraction of the cost. It’s what we did at our office!